Six months ago, Alexa Gordon’s engagement transformed from happiness to betrayal. Christmas is on the way. The last thing she wants to do is spend the holiday in mourning for being so foolish with her emotions. A spontaneous, soul-reviving trip to London is just what she needs. Peter Colby, a treasured friend from Alexa’s study abroad term in England years ago, welcomes her back to the UK with open arms. He knows she’s still reeling, but he’s determined to show her a proper, fulfilling love that will keep her at his side forever. But they live half the world apart, and Alexa is shattered by past pain. Can Peter help her find the courage she longs for? 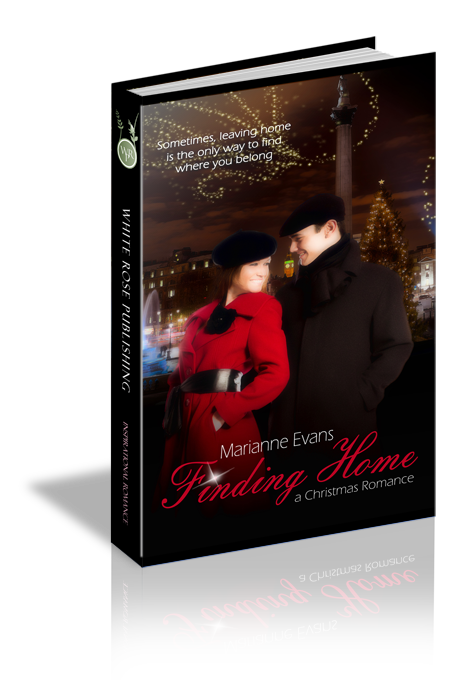 Can he convince Alexa that finding home isn’t just about logistics, it’s about the power of the heart? The dance was as familiar as a Southern California sunrise. Stove to sink. Sink to refrigerator. Refrigerator to pantry. Alexa Gordon gathered supplies and stirred pots, flowing into her pastry baking exercise with effortless precision. But a decided lack of heart. She tightened her grip on the hot pad she held, going taut. Six months have passed, she chided herself. Something’s got to give. A glossy, hardcover book, featuring pastry recipes, rested open atop the spacious granite counter where she worked. Looking at it caused tears to build, stinging against the corners of her eyes, threatening to spill over. The book came straight from the hallowed halls of the world-famous food hall at Harrods—a favorite haunt when she had visited London in less heart-complicated times. Following a few rapid, vision-clearing blinks, Alexa squared her shoulders. Near the book, a large glass bowl stood at the ready, filled with flour, sugar, baking powder, and salt. On a nearby cutting board, she sliced cold butter into small pieces and dumped it into the bowl. Taking out her mood on the mix, she worked the combination until it was coarse and fell through her oil slickened fingertips in small crumbles. Would this wretched cloud of sadness ever dissipate? Her gaze came to rest on a professionally mounted, sparkling night shot of London’s famed Tower Bridge. A necklace of lights framed the bridge, and the illumination of the surrounding architecture transformed the night sky and water into a perfect, mirrored reflection upon the placid waters of the river Thames. The photograph captured just one of a million views her heart held of that magical city—and Peter. Vanessa, too, of course, but Peter most. The photo rested within the metal curlicues of a small display easel. The easel was a find from Covent Garden, a treasure she had snapped up after spying it on the shelves of a small, bustling stall she discovered one spring afternoon while strolling Jubilee Market with Peter. Blowing out a breath, she forced herself from the memory of curving, cobbled streets, rose-colored sunsets, and the massive dome of Saint Paul’s Cathedral. She had been so happy then, so eager and idealistic. Amazing what nearly three years of life and love had done to shatter that point of view. Her throat constricted. In answer to that reaction, she diverted her attention. Whisking together some cream, an egg, and a dash of vanilla, Alexa continued her exercise in scone making, already anticipating the aromas and flavors to come. The batter firmed up nicely. Her heart? Not so much. She set aside the bowl and wiped her hands on the front of her apron. When had her life taken this sad and soul-draining turn? She knew the answer and looked it square in the face. Derrick. Derrick Maddox—code name Derrick the Destroyer. Alexa bit her lips together. It amazed her, the way a single, three-letter word could sever a piece of the spirit and chop confidence at the knees. Her chin quaked and her chest went tight. She tried to keep from crying, and failed. Tears splashed her hand as she braced against the counter. Tension performed a slow-build, starting at her shoulders, working up her neck. Lifting her chin, she forced herself to finish the scones. They’d make a nice offering for her parents at some point this weekend. Her motions lacked zeal, though. Now, even her passion for creating the most succulent pastries imaginable waned and evaporated. She had to find a way back. She had to find joy, recapture a sense of happiness again. She had no other choice. The temperature indicator on the oven emitted a sharp beep and she jumped. Pastry dough awaited her. In practiced motions, she formed the dough and sliced it into rounds with a cookie cutter. Parchment paper crinkled when she settled the circlets on a baking sheet. She placed them in the oven and set the timer. My plans for you, precious child, are beyond imagining. Alexa flinched at how filling, how real those words became to her, and the impact they possessed. She lifted her chin, unwilling to absorb the words of that calm, clear voice. Still, the Spirit breath slid through her soul with increased frequency of late as she struggled with issues of self-worth, and a mountain of doubts. If you but have the faith of a mustard seed. Alexa’s shoulders slumped. An ache bloomed. So did the sensation of being somehow apart from everything she needed the most. She wanted fruition. She wanted joy. She yearned for fulfillment, happiness. Oh, Lord, she answered in sad silence, if only I could find that tiny pebble of faith You’re talking about. While the scones baked, blanketing the air with a rich, toasted fragrance, Alexa retrieved clotted cream and strawberry jam from the refrigerator. Normally, the process of crafting baked goods filled her with joy and a sense of connectedness to her God-given gifts. A cool breeze, flavored by hyacinth and lilac, drifted through the kitchen window of her ground-level apartment, ruffling the edges of the tied-back cotton drapes. The gust of air drew her attention to the surface of her dinette, where her laptop hummed. Facebook was up and running, as usual. She had fifteen, maybe twenty minutes before the scones would be finished, so, she decided to indulge her passion for cyber connection and spend a few minutes checking in on her friends. Maybe she’d even throw out a status update. Anything beat moping, and losing herself in thoughts of Derrick the Destroyer. Question 1: The theme of Finding Home centers on the truth that God wants us to grow where He plants our hearts. Describe and discuss the ways in which that truth has applied to your own life. Question 2: Alexa faces a crisis of confidence that keeps her from being able to readily accept Peter’s loving advances. Can you, or someone you know, relate to recovering from being negated, or having your self-worth devastated? Describe, if you can, focusing on how the battle was overcome. Question 4: Midway through the story, Peter is faced with the challenge of revising Alexa’s perceptions of their relationship. Whether romantic in nature or not, when has God stepped in and forced you to reevaluate the way you see a person, and relate to them? What were the results? Question 5: Leaving everything that’s familiar, trusting enough to take a leap of faith that enables us to grow from one season of life into the next and embrace something new is another theme of Finding Home. When have you, or someone you know, faced such a circumstance? Discuss how it developed, how it played out and most importantly, how it affected you/them.